Mr. Micawber Enters The Internets: What makes a bookstore go? This is different than succeed. And that's for a different post, I believe. Like any business, large or small, it takes an army of people to make an operation run smoothly. Or even a little shakily, some days. Because the reality is that there are so many ways for things to get screwed up. Some our fault. Some others. Sometimes with no one or thing to blame. This time of year Mother Nature can change even the most well considered plans. A shipment can be delayed not due to severe weather in MN. The routing from a publisher or wholesaler can get set back a few days. Or boxes can get sent to the wrong store. Though, to be fair, that has happened a lot less frequently than it did a few years back when there was a Micawber's in Princeton, NJ. We got each others' shipments with enough regularity that it became my default first thought when a box was late or missing. So what, or whom, makes us go? Here is a list in brief as it's something I've been thinking about over the last month or so. Our FedEx and UPS drivers do ridiculous work. All year long they lug boxes and must be careful not to throw them around and damage everything. It's long and mostly thankless work. Throw in icy streets, holiday deadlines and increased volume and the job is only more difficult. I've spoken before about some of our sales reps and the only problem in doing so is the good ones I leave out. Steve Horwitz, of Abraham Associates, just sent us an e-mail letting us know about how he had helped our order qualify for a better price. His knowledge not only about his book list, which is extensive, but about our store and its customers is a great help to us. This type of sales group, which represents a large range of independent publishers, is under as much pressure as anyone in the business. Steve and his co-workers do it best. 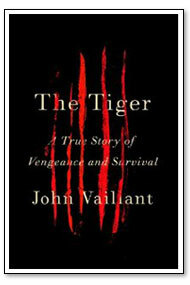 Cole Becker, just recently retired from Random House, did both myself and Micawber's a great service by introducing me to John Vaillant's enthralling "The Tiger: A True Story of Vengeance and Survival" very early in the game. When Cole was passionate about a book he could bring its essence into just a few powerful sentences. It was crystalized. I read the book immediately and was crazy about and have said, ad nauseam, that it's the best non-fiction I've read in the past five years. I've made my mom read it, friends read it and countless customers. Through another publishing friend I even got a signed copy from the author--thanks Dan C. from W.W. Norton! The path to any small store selling lots of copies of a book is very rarely that a bookseller just picks up a book and handsells it like mad. There are often others in the pipeline. Bill Roth is a long-time friend and customer of the store. He is also the local Ingram Book Company rep. Ingram is one of the two main national wholesalers. They are the important middle-men to stores getting re-orders or special orders in quickly. We use Ingram at a pretty high volume and with that comes some problems or questions. Bill, without fail, gets back to us promptly. He e-mails us with answers about specific books. He calls from far-flung locales when he's on the road. He is an employee of Ingram but he's an active agent for his accounts. Working on our behalf to make the wheels squeak a bit less. He's a gentleman and absolutely reliable. Finally, one new piece was thrown in this year. On December 11th, when we were hit with our biggest storm of the year, there was a guy outside the store who helped people shovel out for the entire day. A few days later I saw him, and a few other guys, with shovels and picks and one lone snow-blower. It turns out that this man is Lane Anderson and he's in charge of the snow removal crew working on Milton Square(where Micawber's resides). Lane is friendly and and tireless. There have been many nights this winter when he's been here as I left for the evening and was here again when I arrived the next morning. He loves Bukowski and smokes cigars and has a certain zen calm despite, literally, working in the storm more often than not. If you're a local and in need of snow removal please contact me and I'll put you in touch with Lane. Of course, this is just one little group, and tomorrow I could come up with another. This behind the scenes group enables us to keep one foot moving in front of the other. We salute you.